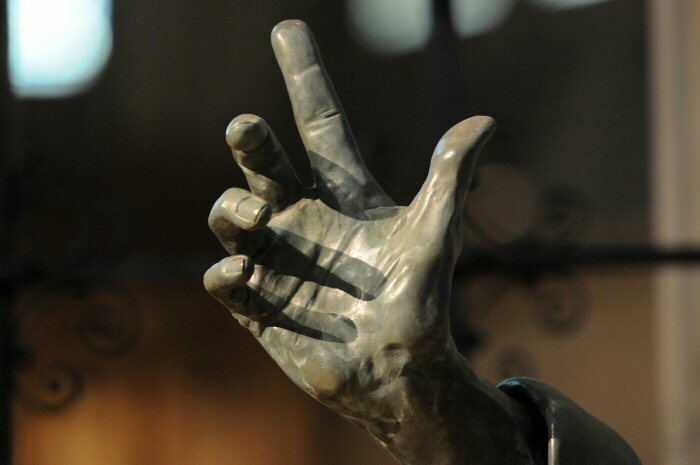 This life-size bronze sculpture of St Matthew, our titular saint, is the most recent artistic addition to the church. It stands on a plinth constructed of Italian Nabresina Marble. The work was commissioned from Ian Rank-Broadley (b 1952) one of the foremost sculptors working today. His effigy of H M Queen Elizabeth II appears on all UK and Commonwealth coinage since 1998. In 2007 he completed work on one of the most important war memorials since World War II, the Armed Forces' Memorial at the National Memorial Arboretum, containing two large works by Rank-Broadley as part of its centrepiece. 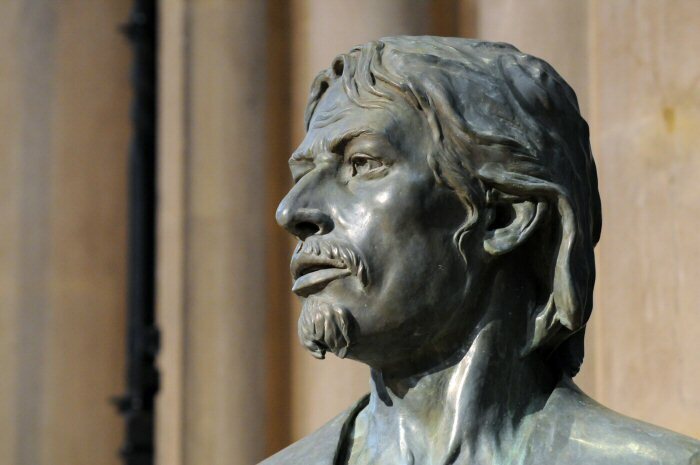 Further examples of his work may also be found in the Supreme Court, The All England Lawn Tennis Club, Wimbledon, St Paul’s Cathedral and Westminster Abbey. a benefaction from the estate of the late Canon John Morton, Vicar of St Matthew’s 1975-1996, given specifically for this purpose, and by the generosity of parishioners who purchased a limited edition of ten bronze maquettes. 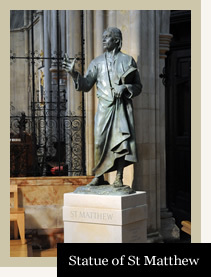 The sculpture itself was dedicated at a special Sung Mass on St Matthew’s Day 2009 in the presence of the Morton family. The preacher on that occasion was Canon Martin Warner, then Treasurer of St Paul’s Cathedral, London, and recently translated from the bishopric of Whitby to the See of Chichester. As an apostle, St Matthew was commissioned and sent by Christ after his resurrection to proclaim the Good News, to teach and embody the new life offered by him to all who respond in faith. An apostle points the way to Jesus. In like fashion, from a liturgically sensitive position on the south side of the nave sanctuary, the sculpture selflessly directs the worshipper’s attention toward the nave altar where week by week the risen Christ is made present in the outward signs of bread and wine. St Matthew is thus a stimulus to prayer and reflection rather than an unhelpful distraction. Viewed from the nave, the sculpture restores an equilibrium with the alabaster and marble pulpit on the north side. The colour of the bronze is a mid tone between the pale Bath Stone of the interior and the black ironwork of the Quire screen. The St Matthew sculpture may profitably be viewed in relief against these backgrounds from a radius of almost 180 degrees. Rank-Broadley has carefully taken account of the environment afforded in St Matthew’s. His work is, perhaps, controversially traditional, though being of the highest quality is fully worthy of its environment. There is a wonderful sense of movement and life in both Matthew’s pose and gesture. Simply dressed, he is shown in the open air, the breeze catching his clasped robe, the folds changing with the light. The underlying bone structure of the face is Semitic. He gestures with his right hand, as if in animated discussion, whilst under his left arm he holds an admittedly unhistorical bound book of the scriptures, the conventional sign in Christian art denoting an evangelist. 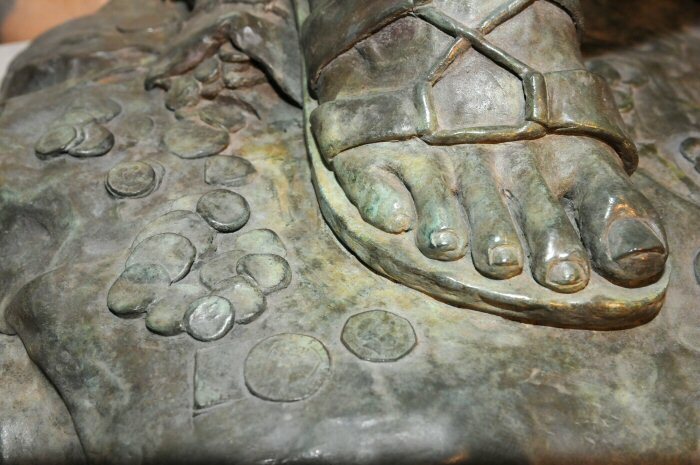 Matthew is the former tax collector turned disciple. This occupation was despised by his fellow Jews as a betrayal to the occupying Roman force. Christ ate with Matthew and his friends, scandalizing those around him. Matthew followed at his call and this was enough for Jesus, for he had drawn someone back to God. He was forgiven, acceptable, and received. Matthew’s right heel bears down on a discarded money bag. Various coins are strewn on the ground; among them may be found impressions of the pre-decimalization coinage. Together these symbolize the former life left behind. Matthew was a man with a past who knew his need of forgiveness and acceptance, and experienced first hand the gift of Christ’s affirming call to follow him. The sculptor has caught something of these experiences. There is strength of purpose and sensitivity, dignity without loss of humility, a hint of what we may become when we respond in faith, hope and love. 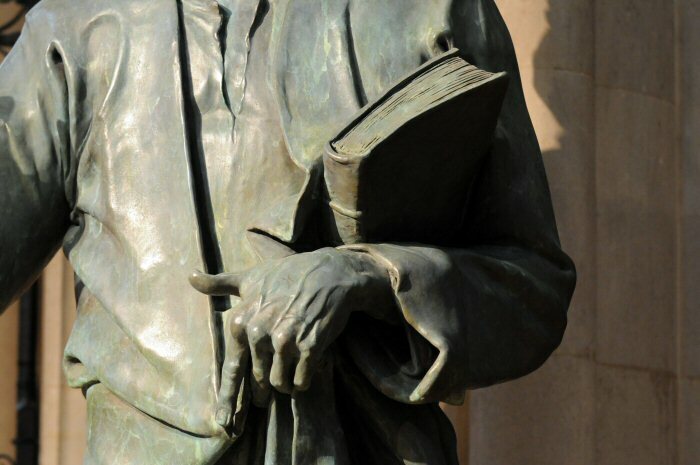 "When the Church blesses a statue and presents it for public veneration to the faithful, it does so for the following reasons: that when we look at the representation of those who have followed Christ faithfully, we will be motivated to seek the city that is to come; that we will learn the way that will enable us most surely to attain complete union with Christ; that, as we struggle along with our earthly cares, we will be mindful of the saints, those friends and co-heirs of Christ who are also our own brothers and sisters and our special benefactors; that we will remember how they love us, are near us, intercede ceaselessly for us, and are joined to us in marvellous communion."